All aboard!!! It’s time for Funicular Productions line of award winning theatre professionals to bring you their first immersive dining experience The Murdér Express. Set in the 1900s, this event is sure to entertain as you wine and dine on delicious cuisine from MasterChef 2016 finalists Billy and Jack. The attention to detail of this production is fantastic. Before you even enter the building, the theme is already set with signage and a mock up a ticket booth. Upon entering the archway into the station, you gettransported back to the era when trains were the predominant form of travel. 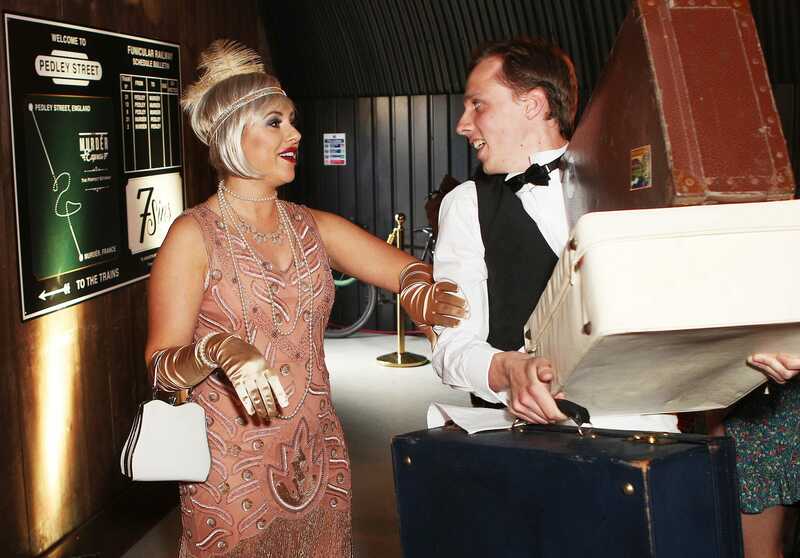 There is a bar, DJ Professor Gramophone and props providing a great atmosphere to enjoy a drink before entering the train. Each cocktail has a unique name matching the theme of the night. Some include The Conductor (vodka, elderflower, prosecco and lemon) and Loco Motive (raspberry blend with gin and lemon) which was my personal favourite. The characters wander around the room introducing themselves to individuals and react to each other’s presence. This provides some terrific entertainment even before embarking on the journey to Murdér, France. I spoke to Tomathy before boarding and his back stories were hilarious to say the least. He was my favourite character throughout the production. The conductor calls for everyone to embark the dining car for the official start to the show. The dining car looks incredible with all the delicate details in the props. Right down to the inscription on the napkins. 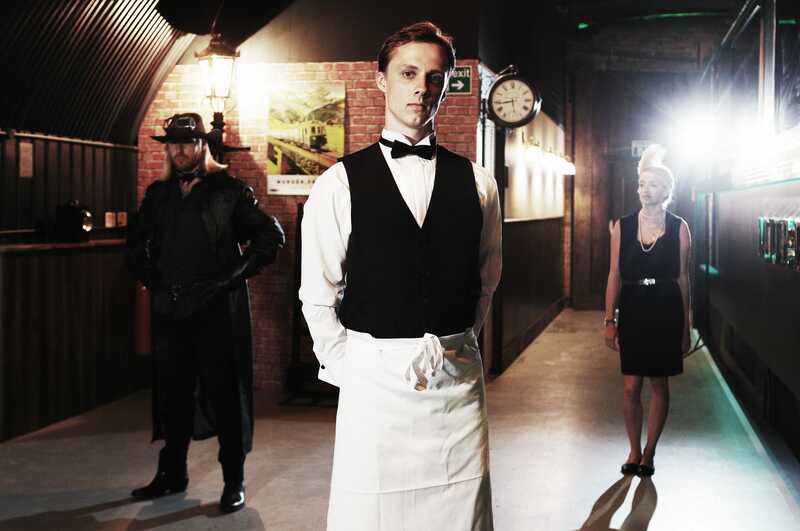 Being an immersive theatre experience, some characters join you at the table whilst others serve you dinner. The train trip portrays the journey using visuals on the windows of various scenery. I thought it was great that the visuals mirrored on the way back to London. This contributed to the minute details and was very clever indeed. My only negative of the entire experience is that better visuals could have been used for the scenery. As the production plays out, there are 3 courses served. First is a Mulligatawny soup with an Indian spiced open cucumber sandwich. A choice of 2 mains – Butler’s steak, stuffed, pressed scallop potatoes and Savoy cabbage OR Spring vegetable pithivier with seasonal vegetables which is the vegetarian option. For dessert is an Apple tart, clotted cream and à la Lady Portarlington. All three courses were delicious. But the standout by far was the pressed scallop potatoes which I could’ve had for dessert too. The Murdér Express (as the name suggests) is a murder mystery. With characters and passengers trying to solve and apprehend the culprit. A vial of poison gets passed to your table and you need to find a sneaky method to get rid of it before you are accused. The characters are fantastic throughout. Plus, there are plenty of opportunities for the audience to get involved. It was a funny and more comical approach to a murder mystery night with much laughter throughout. The story ends with a big twist. But you will have to go and see to find out for yourself. I recommend getting down to Pedley Street Station to attend The Murdér Express. Funicular Productions have not only delivered a great night of entertainment. But with their partners Billy and Jack provided some delicious food. Plus, the cocktails and wine don’t hurt either. Funicular, Arch 63 Pedley Street, London, E1 5BW.